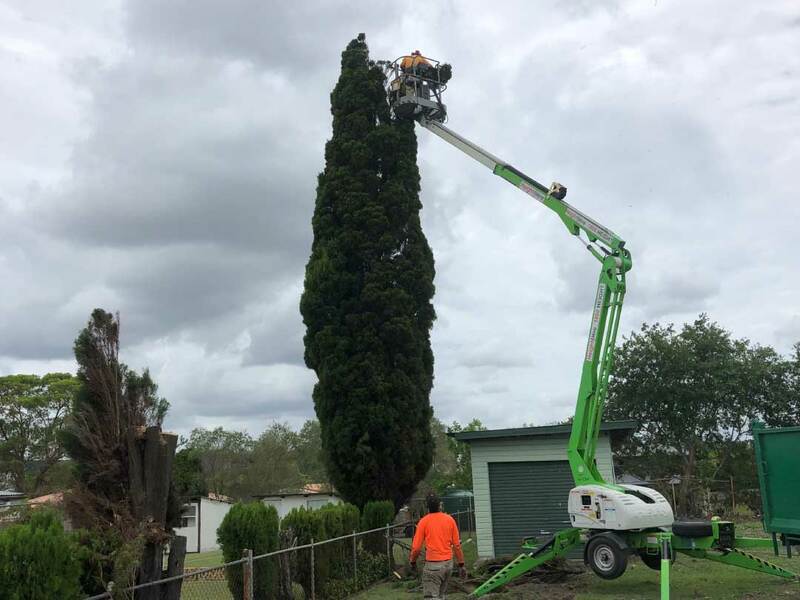 We offer a wide range of tree services in the Brisbane area. Whether you want to have a tree pruned, trimmed or removed from your property, we have got you covered. We also offer stump grinding, palm cleaning, palm removal and land clearing services in the Greater Brisbane Area. Removing a tree sometimes becomes necessary for a variety of reasons. Perhaps the tree has decayed and the rotting branches pose a threat to you and your family. Or the tree has been significantly damaged after a storm and removing it is the best option. You may also need to have trees removed when the roots start damaging concrete driveways, house foundations or underground plumbing installations etc. In some cases, trees may obstruct planned construction and other land projects. Some homeowners decide to have a tree removed from their property because it harbors pests. Some pest problems can be resolved and you may not need to have the tree removed after all. Other pest problems can be quite serious and the tree removal may be the only way forward. If you are considering tree removal in Brisbane, contact us today. Here at Tree Lopping Pros, we offer free advice and consultation. If your tree can be saved, we will do our best. If it needs to be removed, we will get it done in the most effective way. We offer professional tree removal services that are safe, quick and efficient. We believe in getting the job done in the best possible way. 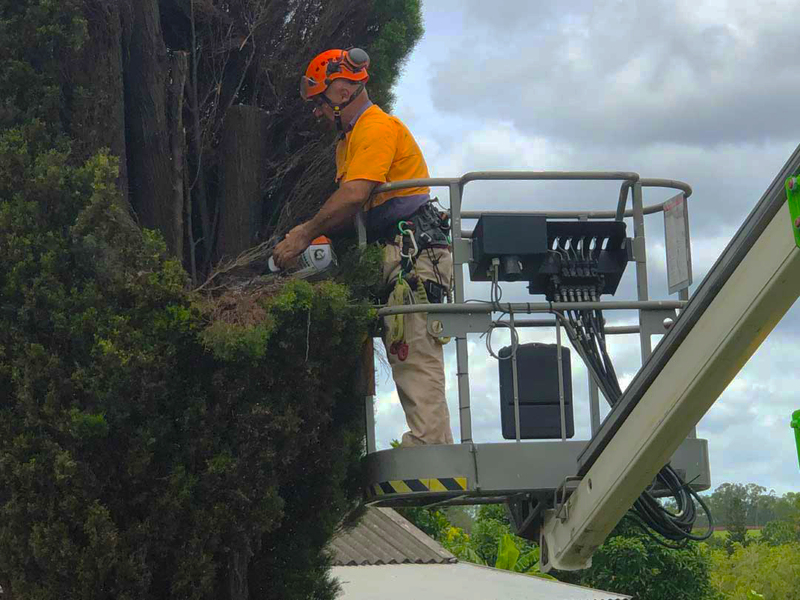 This is why our Brisbane tree removal experts use cutting-edge tools and follow the safety guidelines when removing trees from your property. We take a structured approach to tree removal. Our team first surveys the trees that need to be removed. The exact method of removing a tree depends on its height, spread and type. Once our team has taken stock of the tree and the surrounding property, we agree upon the best way to have the tree removed. We also put all the necessary safety precautions in place before we actually begin the removal process. This is done to ensure the safety of the workers involved in the removal, your safety and the safety of your property around the tree. Having trees on your property is perfect for a quality outdoor time. However, trees with rotting branches are a significant danger. Such branches can fall down at any time and cause damage to persons or property. Similarly, branches overhanging your house or the power lines are also a liability. In case of strong winds or a storm, these branches can fall down and cause havoc. We offer tree lopping services that effectively take care of any trees that may become a safety issue. By lopping the branches, the crown and other sections of a tree, we are able to salvage the tree while effectively eliminating its risk. In time, the tree grows back with healthier branches and you are able to enjoy a safe outdoor time. Top-heavy tree crowns. Some trees can grow significantly tall. As they grow tall, the crown becomes too heavy to be supported by the trunk and strains the tree base. This can cause the tree to fall down easily in case of a strong wind or a storm. Tree lopping checks this danger by reducing the strain on the tree base. It also enables wind and light to come through, enabling a healthy re-growth. Broken or damaged branches. Brisbane residents may experience broken or damaged branches on their trees in the wake of severe weather conditions. Such branches can rot and eventually fall, posing a major risk to you, your family and your property. This is why we recommend having these branches removed at once. Deadwood. Over time, portions of a tree can rot, become diseased or become dead. These pose a perennial threat to persons and property. Our Brisbane Tree Lopping services deal with such trees. We remove the deadwood in a safe manner to encourage healthy growth of the rest of the tree. If you have trees on your property, they need ongoing maintenance. Trimming the trees on time is an important part of such maintenance. Timely trimming of the trees has many advantages. It ensures a healthy growth of the trees; it ensures that they pose no risk to you or your property; it also enables you to achieve a picture-perfect look for your outdoor area. Reducing the canopy or crown size. Top-heavy trees can be a major risk. Their top-heavy structure causes them to easily fall during windstorms or severe rains as the base is unable to support the weight of the top. To prevent such an accident, the canopy is trimmed to reduce the overall weight of the crown. This procedure is often referred to as a Crown Reduction. Removing dead or rotting branches. Sometimes, trimming is performed with the specific aim of removing dead or rotting branches from a tree. Removing these branches thins the foliage density and allows the air and sunlight to filter through. In the long-run, this promotes healthy growth for the rest of the tree. Here at Tree Lopping Pros, we offer tree trimming services for trees of all sizes and types. We are licensed and insured, and our Brisbane professionals use specialized equipment to get the job done. Pruning is a great way of keeping trees in shape and ensuring a healthy growth. Pruning is typically performed on trees that have overgrown. When pruning is performed by a qualified professional, it removes unnecessary or rotting branches from a tree. At the same time, it encourages the healthy growth of the tree. When to have your tree pruned? Overhanging branches: Branches overhanging your property, the power lines or any other structures can become a hazard during a storm. They may fall down and damage persons or property. Pruning effectively removes these branches selectively so that they are no longer a hazard. Overgrown trees: Unchecked overgrowth of a tree can turn its natural beauty into a mess. At the same time, such overgrowth can become a hazard in the dry summer spell in Brisbane. If left unattended, trees can pose a real fire hazard during the summers. Pruning prevents this by removing the overgrowth and keeping the size of the trees in check. Aesthetic reasons: So you want to achieve a certain shape and size for your tree? No problem. Pruning can achieve that. In fact, strategic and selective pruning can change the shape of your landscape by letting you customize your trees. Here at Tree Lopping Pros, we have in-house arborists who have extensive experience with pruning a wide variety of trees. In particular, our professionals have experience in pruning and maintaining the tree varieties that are commonly found in Brisbane. It is vitally important that you hire a professional to perform pruning. When done right, pruning can encourage the healthy growth of your tree. However, when done by an inexperienced person, pruning can irreparably damage the tree and prevent its growth. Our pruning specialists know exactly when it is the right season to prune the trees. They are also trained in the industry best practices on how to prune effectively while ensuring the health of a tree. If you have palm trees on your property, you already know the pros and cons of it. The upside of palm trees is that they add beauty and a tropic feel to your property. They also offer good shade in the sun and some varieties offer delicious fruit year after year. That being said, palm trees can also be a liability for many homeowners. For a start, they are incredibly hard to maintain. Unlike many other trees, most palm tree varieties require diligent maintenance. Some palm trees will drop their fruits once ripe. You can either harvest the fruit on time – or you will have to clean the debris from the tree base. Yet other palm tree varieties do not drop their fronds which keep hanging to their branches. These have to be manually removed or they entirely mar the graceful looks of the tree. Another persistent problem with palm trees is that their fruit can attract fruit bats. If the fruit is left hanging on the branches, fruit bats can become a major nuisance. If the fruit is allowed to ripen and drop without being cleared from tree base, it can also attract rodents and other smaller animals. No homeowner wants to attract these unwelcome guests to their property. This is why many Brisbane homeowners frequently hire us to maintain palm trees or remove them altogether. When to remove a palm tree? As explained above, a palm tree can be managed effectively through diligent maintenance year round. However, there are instances when removing a palm tree is a better choice. For instance, if a palm tree is suffering from Ganoderma Rot, it is time for it to go. This is a disease which causes the palm’s wood to rot at the center. You can identify the disease by a horizontal white circle that appears on the bark. Palm trees may also need removal if their roots have grown weak. Some palm varieties grow to a considerable height and weak roots means that these trees are not strong enough to weather summer storms that are common in Brisbane. If left unattended, such trees can fall down and cause significant damage. Here at Tree Lopping Pros, we specialize in removing all varieties of palm trees. Depending on the variety and size of the tree, we determine whether to fell it in one go or remove it piecemeal. This is done to ensure the safety of the property and persons in the vicinity of the tree. Palm trees are a high-maintenance plant. They do make a landscape beautiful bringing that tropic touch that is often favored by residents around Brisbane and other parts of Australia. However, homeowners are often overwhelmed by the task of rutine matenance and cleaning of their palms t in their backyard. Dead fronds: Dried and damaged palm fronds can die. These fronds still stay intact but they are an ongoing risk. Strong wind, rainstorms and other weather conditions can easily snap these fronds and bring them crashing down. The result is potential harm to property and persons. Hanging Fronds: Some palm varieties are categorized as non-self-cleaning. This simply means that unlike other palm trees, their fronds do not fall on their own. Instead, the fronds keep hanging to the Palm unless they are manually removed. The resulting dead frond apron or skirt although providing habitat for wildlife can take away from the desired aesthetic and the Palms appeal in a domestic environment. Fruit Problems: Another major problem associated with palm trees are their fruits or berries. Palm fruit will either ripen on the branches, attracting fruit bats. Or the ripe fruit will fall down, create a mess at the Palm base and attract rodents and pests. For these reasons, manually harvesting the palm fruit on time is an important part of palm maintenance. Here at Tree Lopping Pros, we offer professional palm cleaning services in Brisbane. Whether your palm needs to be rid of dead fronds or you want us to take care of the fronds and fruits, we have got you covered. We also clear the tree base completely and restore the clean, tropical appeal of a palm. You can hire us to perform regular cleaning and maintenance of your palms, or do a one-off cleaning job. When performing tree removals, some homeowners prefer to have tree stumps remain intact to a desired height. This can be for a variety of reasons. Stumps can become a decorative garden feature. Some innovative uses we have seen include a stand for a bird bath, seating and table furniture just to name a few. But they can also become a significant problem. If not looked after or maintained, tree stumps can quickly become a target for pests and termites. Once infested, the pests will infect the entire root system of the tree and spread over a significant underground portion of your property. For this reason, many Brisbane homeowners choose our stump grinding services to get rid of any tree stumps on their property. The stump grinding process involves the use of high-speed grinding wheels. The wheel turns the stump into very fine wood chip which can be subsequently used as ground cover or mulch. The stump is grounded to below-ground level during the grinding process. This removes it from your property, with only the underground root system remaining intact. If you simply wish to restore the aesthetic appeal of your property, stump grinding is a very effective and affordable option. However, if the tree stump has been infested by pests or termites, the entire stump will need to be removed by digging it up from the ground. Stump removal, as compared to stump grinding, is a more time-consuming process as it requires significant labour and effort. However, it is the only way to get rid of an infested tree stump. Tree Lopping Pros offers stump grinding and stump removal services for all Brisbane suburbs. We use heavy-duty grinding equipment to ensure quick and efficient stump grinding. We also strive to use environment-friendly techniques in removing a stump from the ground. If you’ve purchased a new piece of land, it needs to be cleared and repurposed before construction or landscaping can begin on it. This is particularly true if your new property is situated in the bush or has a lot of vegetation and trees on it. There’s also the possibility that you aim to clear a previously treed area for a new project, such as a fence line or new construction. In any case, land clearing requires a significant effort. You may end up having to remove trees, bushes and other types of vegetation. Each tree type has a different shape, height and requires a different removal or lopping technique. So you also need to consider these differences. The best course when dealing with land clearing is to hire a professional company like Tree Lopping Pros. We have the full range of specialized tree removal and lopping equipment, stump grinding machines, chainsaws, axes and other tools to get the job done. We also have an expertise in removing trees of all shapes and sizes from a property. Depending on your needs, you can specify whether the tree should be cut down to the stump, stump-grounded to the ground level or removed along with the root system. The benefits of hiring pros to perform land clearing are numerous. You don’t have to worry about finding the equipment. You have complete peace of mind that the pros will remove trees, bush, stumps, deadwood and all other vegetation. And you can rest assured that all the resulting debris will be removed from the property. Another advantage of professional land clearing is that you can have as much as wood chip mulch as you want. You can subsequently use the mulch to line the garden beds and keep weeds at bay. If you live in Brisbane, you already know the fickleness of the summer weather. The sunny day may quickly turn into heavy gales and rainstorms without any time for preparations. Severe summer weather conditions in Brisbane have a way of knocking down trees and causing significant damage to property. If you are experiencing such a scenario, you need to hire a professional tree removal company on an emergency basis. It’s always better to take precautions beforehand. Have tree care professionals take stock of the trees around your property and identify any overhanging branches that may pose a danger. Overhanging branches can fall down on power lines or the property in the case of strong winds or a storm. However, if tree limbs have fallen down on your property during a storm, you need to contact a professional tree removal service right away. Attempting to remove the limbs on your own can pose many hazards – for a start, the wet weather and rainy conditions can cause electrocution through the fallen limb which can be fatal. This is particularly a risk if power lines are involved in the crash. Even if the limb has fallen directly on to the roof or any other structure of your home, it’s highly recommended that you call the pros to handle it. If you try to do it yourself without access to specialized equipment, it may only worsen the damage and cause further harm to the roof structure. Tree companies based in Brisbane, such as the Tree Lopping Pros, are usually on standby during stormy conditions. We understand that tree-related emergencies can often occur during such weather, which is why we offer emergency tree removal and other tree services at such times. If you are facing tree-related damage during a storm, give us call right away. We will be at your place in no time to take stock of the damage, determine if any power lines are involved, and then use specialized equipment to remove the fallen limbs.